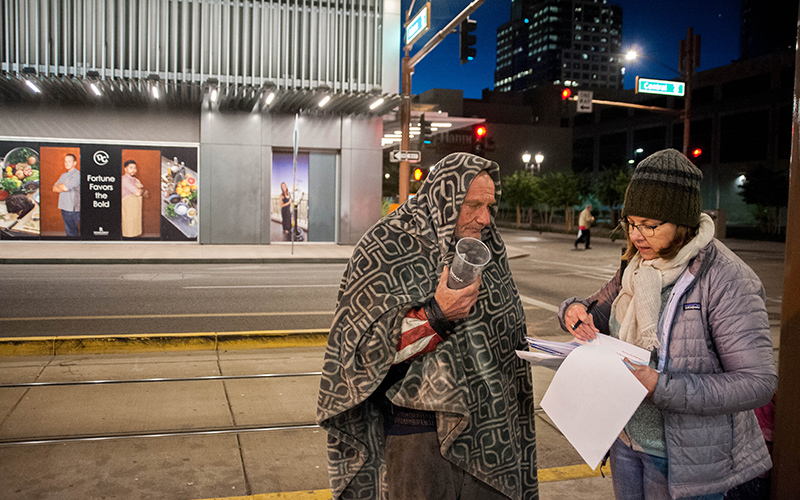 WASHINGTON – An estimated 88,529 Arizonans rose out of the ranks of poverty last year, but that still left about 1 million – or one state resident in seven – living below the poverty level, new data show. The latest Census Bureau figures also show that Arizona’s poverty rate fell faster, but remained higher, than the national average last year. Poverty in Arizona fell from 16.4 to 14.9 percent, while the national level went from 14.0 to 13.4 percent in the same period. The numbers did not surprise Arizona experts, who say the state has historically higher levels of poverty, but is coming back faster than the nation because it had so far to climb after being hammered in the recession. And even an improving economy does not mean everyone in the state is doing better, said Cynthia Zwick, executive director of the Arizona Community Action Association. “More and more folks are working, but the wages are not yet keeping up with what is needed to support a family or an individual who is working full time,” Zwick said. The Census Bureau’s definition of poverty varies according to the number of people in a household. A single person who made $12,488 last year was living at the poverty level, as was a family with two parents and two kids making $24,858. Last year’s drop in the poverty level marked the sixth straight decrease, which experts attributed to a steadily improving economy and a near-full employment rate. Nationally, Mississippi remained the state with the highest poverty rate, at 19.8 percent, and New Hampshire was the lowest, at 7.7 percent. Among large metro areas, the 1.7 percent drop in Phoenix, to a poverty rate of 13.3 percent, was one of the steepest in the country. But, like the state, the Phoenix metro area’s poverty numbers were still among the highest for a metro area – only Houston, Tampa, Los Angeles, Orlando, Miami, Riverside, San Antonio and Detroit were worse. Compared to some other areas in the state, however, the Valley is doing relatively well. Yuma, Pima, Mohave and Coconino counties had poverty rates ranging from 16 to 19.9 percent, according to the Census. David Lujan of the Arizona Center for Economic Progress said he does not think the higher rates in other parts of the state is an accident, but is the result of the current focus of public policies. “A lot of the policies that come out of the state capital are too focused on Maricopa, and you don’t see a lot of efforts towards rural areas,” he said. He said the state has to start thinking in ways it can replace the old mining jobs that disappeared and train the rural population to be able join the workforce having better-paying jobs. “We have many, many people living at the low-income level and then we have many people living at the much higher income level, but the middle class is pretty much nonexistent,” she said. And the rising cost of living continues to pressure income, Zwick said. Zwick said that while the improvements so far are welcome, the state still has a long way to go. “I would love if we dropped below the national average, but I don’t see this happening,” she said. “I do know there’s a trend for higher paying job across the board nationally, I suspect that’s beginning to happen here as well. “But we lag behind in those kinds of advances often. It would not surprise me if we are still lagging behind the national average next year,” Zwick said.